In the course of the ICC World Cup Qualifier, there were a range of injuries sustained by Canadian players. Canadian Physio Dan Kiesel provided a summary of the main injuries during the 19 days of the tournament just before the entourage left the Sandton City Sun hotel in Johannesburg on Monday. A simplified version of those injuries follows, but it becomes obvious there was a lot of work for the Physio, who also acts as a fine public relations servant for Canadian cricket. He also brings a camera and does what he can, in between dealing with injury, fitness, hydration and nutrition issues, to record on film a record of each game. The most obvious was the leg injury to all-rounder John Davison which kept him sidelined for the Super 8 phase and the Final, played on the SuperSport ground in Centurion where he hit his famous 2003 CWC 67-ball century against the West Indies. Davison suffered from a calf injury and had to have some blood drained. He recovered quickly and Kiesel expects Davison should be good in about four weeks. But the tournament took its toll on a range of other squad members. Three of the batsmen had to use splints for part of the time when not playing. The strains on some of the all-rounders and pace bowlers resulted in a range of back, shoulder, neck, knee, calf and feet ailments. Overall, most respond well to treatment but some playing in a range of discomfort. Ian Billcliff played on despite a fractured index finger on his right hand, Billcliff said it was not a real problem when batting, but it did cause problems when fielding. He was pleased to hold on to a good catch in the Final behind square on the off-side in the Final against Ireland, despite the injury. Geoff Barnett dislocated the middle finger of his left hand. Captain Ashish Bagai had an overstrained wrist. Barnett and Bagai each had some wore some splints when not playing, according to Kiesel. The workloand on the likes of Henry Osinde, Umar Bhatti, Harvir Baidwan, Khurram Chohan and Sunil Dhaniram resulted in a range of overstrained backs or shoulder and neck muscles. Sandeep Jyoti had inflamation of the calf muscles and feet while Asif Mulla had knee troubles. Osinde, who had strains on the left side of his back, was able to play with the support of taping. Treatments included local injections, antibiotics and some other medications. It was pretty warm and the sun shone on grounds with generally well maintained, fast outfields on South Africa’s High Veldt and most of the wickets favoured batting . The South Africa-ODI series was taking place during the same period as this World Cup Qualifier. Progress in the modern one-day game sees high scores being made, with 300 almost a starting point where the wicket favours batting, despite facing experienced bowlers and some fine fielding. There is little or no room for mistakes in the upper levels of ICC Full Members playing one-day games, and the schedule is heavy on a year-round basis. It is a tough proposition for leading Associate countries to go up against the front-line teams of the world’s best teams and it can be tough, even, to play in tournaments such as the World Cup Qualifier out of season, as several teams did in South Africa. Tough, but Ireland is showing potential in moving to the next level. Canada needs better playing facilities and practice facilities in order to be able to keep up or move ahead of rival Associate countries. Opportunities to develop and improve cricket facilities have been missed in recent years. Money has been a problem, but with proper business cases and applications for government funding and corporate sponsorships, progress could and should have been made. The status quo cannot go on if the national team is to, at minimum, retain its leading position in the ICC Associate rankings. There is potential for the likes of Canada, and the USA, to become flourishing centres in a truly expanded global setup, provided both countries cricket’s leadership in each country works for the overall good, development and promotion of the sport. Easy to say, but, so far, much harder to achieve in Canada. But these are words for an era of new hope, determination, and accomplishment. the City News website for video coverage of Canada's arrival home, an interview with Ben Sennick and more! There are currently 500 members of Canada’s Sports Hall of Fame. (http://www.cshof.ca/) There are five harness racers, two snooker players and four soccer players, but no cricketers. Hopefully this will change with the nomination of Frederick James Heather. He is an excellent candidate and I hope that all supporters of Canadian cricket will join Cricket Canada, the Toronto Cricket Umpires and Scorers Association, the Toronto and District Cricket Association and the Telecom Pioneers of Canada in supporting his nomination. Whilst Fred Heather’s nomination to the Hall of Fame is as a “builder” rather than as an “athlete”, he was a keen player in his youth, playing for the St. George’s Cricket Club that won the Toronto City Championship in 1922. He also played for the Bell Telephone Cricket Club, John Ross Robertson Finalists for the Canadian Championship in 1927. It is an umpire though that Fred Heather is best remembered. The words that follow are taken from the nomination submitted to Canada’s Sports Hall of Fame Selection Committee. Upon retiring as a player, Fred Heather embarked on a career as a Canadian cricket umpire. He started umpiring in Toronto in the late 1920’s. His first international experience came when a Toronto team faced the Bermuda Wanderer’s Cricket Club on August 4, 1931, marking the first international match for a Canadian team in a decade. In 1932, he umpired for the “Good Will Tour.” This was an Australian team that toured North America featuring Don Bradman, Vic Richardson and many Australian “Test level” players. Mr. Heather umpired for the Eastern Canada versus Australia matches. With an estimated 8 000 cricket fans, this set an attendance record for the sport of cricket in Toronto (Globe and Mail, 1932). Additional international experience includes: Sir Julien Cahn’s Touring Team (a First Class calibre team of all-stars), 1933: Cambridge University Vandals, 1934: The M.C.C. (England) Tour of Canada in 1937, 1951 and 1959. During the 1951 M.C.C. tour, Fred Heather stood with former English cricket professional A.V. Pope as one of the umpires in the three day test match between Canada and the M.C.C. marking the first time a First Class status match was held in Canada. This event opened the door for future First Class matches. Mr. Heather also umpired numerous inter-provincial matches for the John Ross Robertson Trophy starting in 1931, emblematic of the Canadian Cricket Championship. In 1951, he umpired for the Lord Atholstan Cup match between Ontario and Quebec. He also had the unique duty of umpiring the match played between the Canadian Colts touring team which visited the Highgate School in London, England in 1967. In addition to umpiring, Fred Heather contributed to the future success of the sport in numerous roles. He was both Secretary and player for the St. George’s Cricket Club and the Yorkshire Cricket Club in 1922 and 1926 respectively. He then became a founding member and the first Secretary-Treasurer for the Toronto and District Cricket Umpires Association and the Umpire’s Control Board for many years starting in 1931. It was during a 1938 Umpire’s Control Board meeting that Fred Heather stated it was deplorable to light a cigarette between the fall of a wicket. This is significant considering smoking did not carry a social stigma then as it does today. Fred Heather was the principal and professor of a Cricket Umpire’s School in the 1930’s and 1940’s at Trinity College, setting the curriculum to ensure a high standard of officials for future Canadian cricket matches. He was instrumental in starting a junior cricket league in Toronto, resulting in the formation of 18 junior cricket clubs in 1931. Fred Heather served as the Secretary for the newly formed Toronto Junior Cricket League. This league provided cricket for 300 junior players each year. In 1933, two junior teams from this league were the first to play cricket at the Canadian National Exhibition. In addition to starting junior cricket, he was the Vice President of the Dentonia Park Cricket Club, in Toronto, which won the Godin Cup in 1937 and the Continental Life Trophy in 1938 as City Champions. As a result of this work, Mr. Heather became the officer in charge of public relations for Dentonia Park Cricket in 1941. He also published numerous articles for newspapers and magazines to increase awareness and support for cricket in Canada. As of August 12, 1961, Fred Heather had umpired in 1002 consecutive matches without missing a game. He was a Canadian cricket umpire of high caliber for 38 years until his retirement in 1967, making him the longest serving umpire in Canada. Some have called him Canada’s finest umpire (letter from Montreal, 1956) and the most respected cricket umpire in Canada (Toronto Star, March 12, 1940). Recognizing Fred Heather’s achievements, the High Commissioner for Canada requested the honour of his company to attend the ceremony in Westminster Abbey to commemorate Canada’s Centennial Year. As one of the first Canadians to be a member of the Association of Cricket Umpires (ACU) of England, he earned “Full Member Status” on June 7, 1968. This association is recognized worldwide and members must pass a written examination with 80% or higher and perform two years of field experience at a level acceptable to the ACU Passing Committee. It was an honour to reach “Full Member Status” as it was the highest level awarded by the ACU and is equivalent to a Level 5 umpire recognized by Cricket Canada (highest level for Canadian umpires). Furthermore, he was made the first Life Member of the Toronto Cricket Umpire’s Association, on January 12, 1970. This motion was passed unanimously. The cricket community lost a legend of the sport when Frederick James Heather died February 22, 1976, in Toronto. The majority of the Canadian cricket entourage left South Africa on Monday evening after sealing a place in the 2011 ICC Cricket World Cup. Captain Ashish Bagai left for England after Sunday s loss to Ireland in the Final of the ICC World Cup Qualifying Tournament. John Davison, out of playing action due to a leg injury, returned to Australia after seeing Canada clinch the 2011 CWC spot on Friday. Geoff Barnett and Ian Billcliff were bound for New Zealand. Canada’s tournament helpers from Sri Lanka, Marvan Attapatu, brought in as batting coach, and Chandrashan Perera were on the same flight to Dubai but would then go a separate way home, leaving the bulk of the side and support team to go on from Dubai to Toronto. A journey that will end early on Wednesday evening, except for those going on to other parts of Canada. There are positive aspects to overseas travel for these events, but anyone witnessing the scenes as team manager, Mike Henry, became engrossed in a range of discussions to ensure the various extra bags needed for necessary cricketing equipment made it onto the initial Emirates flight to Dubai. At minimum, the equipment and bags being moved by the video analyst, the coach and the team manger (who ends up as default custodian of various extra bags) end up in the overweight to seriously overweight category. The players can also hit baggage problems due to the combination of personal clothing and playing gear needed on long-term international trips. Several had been in Sri Lanka for practice at that Cricket Board s academy before warm-up matches began in South Africa. The World Cup Qualifying tournament then took place over a nineteen day period. Debates over the baggage for each of the team manager and the coach took up 30 minutes or more. But in the end all the bags were checked in and due to make it through to Toronto. There were at least 5 or 6 people from the airline involved in some of these discussions, and possibly some others as phone calls were also made. Canada s tournament liaison support, Johnnny Munien, stepped in to support the baggage transportation situation with the airline. Then, satisfied all was well, he went off to seek his own flight back to Durban. After all was deemed well with the baggage, Mike Henry and Pubudu Dassanayake went off to check on a couple of technicalities over seating arrangements for their flights to Dubai and then Toronto. The pair of them then moved on to the security gates and we said our goodbyes, laughing and smiling. It can be a 24-hour life for some of those involved in leading these missions. But somewhere in the checked bags is the ICC scroll inviting Canada to the next Cricket World Cup. There was certainly disappointment that the last three matches were all lost, but the crucial mission of retaining a top spot in the ICC Associates had been achieved. But those involved in this mission in South Africa have a resolve to see that things improve in Canadian cricket for the longer term good of the game. Patrick Adams is working on a history of Canadian cricket. You can get more information about this project at his wiki page on the project. This extract is exclusive to Canada Cricket online. The Wisdens from 1916 to 1920 list the names of prominent cricketers who died during the First World War. A staggering 182 of these were Canadian, compared to just over 20 Australians; both countries lost around 60,000 men. Considering the standard of cricket played in Australia it is surprising to find so few of their cricketers listed. New Zealand did not play test cricket until 1930 and suffered fewer than 20,000 dead, but had 19 obituaries in Wisden, only one fewer than Australia. Whilst the magazine the American Cricketer recorded the deaths of Canadian players, giving the Wisden editor a source to use to give his obituary list a colonial feel, there was no equivalent publication in Australia. Despite this, the number of Canadian obituaries suggests a disproportionate sacrifice from these cricketers. At the outbreak of war Canada had a population of about 15 million of whom approximately 10% were males of military age. One third of these fought in Europe, with those of British descent and in many cases of British birth, making up the majority. French Canadians had lived in Canada for generations and were less inclined to fight in a European war either for a pro-British Government, which they felt discriminated against them, or for a French nation which they felt had abandoned them. It was the British Canadians who were most eager to fight for the Empire and it was the British Canadians who played cricket in Canada. This was detrimental to Canadian cricket for two reasons. Firstly, and most obviously, it meant that many players crossed the Atlantic never to return. Secondly, the sacrifice of so many Canadians was rewarded with a representative at the League of Nations and ultimately a more independent Canada, free to pursue her own foreign policy. Ironically the death of so many British Canadians led to a decline both in Britain’s influence over Canada and of British institutions, like cricket. It is impossible in a short article to do justice to the 182 cricketers who died in the war. What follows is a selection of what I consider to be the most important stories. The majority of the Canadian cricketers to sign-up did so with the early volunteers and whilst the Canadian army would continue to suffer casualties, particularly during the last 100 days of the war, the number of the cricketers amongst the dead declined. In October 1914 approximately 33,000 Canadian troops crossed the Atlantic in what would become known as the First Contingent. They camped on Salisbury Plain in Wiltshire only to endure the wettest winter in living memory. Huts were constructed, but were poorly ventilated and infections spread: 28 Canadians died from meningitis, including the chaplain of the 3rd Battalion, Reverend Leychester Ingles. He had been a useful medium-paced bowler and a good batsman for Toronto Cricket Club and Toronto Zingari, touring America with both teams before the war. His father, Archdeacon Charles L Ingles, asked that the Reverend Captain Ingles be buried as a priest and a soldier. The Canadians landed in France in early 1915 and the first action for the Canadian troops inevitably brought about its first casualties. Captain Robert Darling had played cricket for the Upper Canada College XI in 1897 and 1898 and was a graduate of the Royal Military College. This Toronto-born merchant had signed up with the 15th Battalion on 22 September 1914 with two other UCC old boys, William Marshall and Trumball Warren. These three comrades were listed second, third and fourth in the nominal roll of the 15th Battalion taken when they signed up at Valcartier; the roll was in order of rank and headed by Lieutenant-Colonel John Currie who was, the only one of the four to survive the war. Darling was shot in the shoulder on 23 March 1915 near Neuve Chapelle whilst serving the 15th Battalion as adjutant. According to the Battalion’s war diary, Darling was wounded when he followed another officer taking a dangerous short-cut to avoid being seen as a coward, instead of walking unhindered along the communication trench. He was given “a Blighty” and invalided to a hospital in London where he died on 19 April aged 28 with his wife Phyllis, whom he had married before leaving for Valcartier, by his side. His body was taken back to Canada where it was buried at Mount Pleasant Cemetery in Toronto: the first Canadian soldier to be killed overseas, but buried at home. His military funeral on 6 May allowed the whole City of Toronto to grieve over the sacrifice that he personified. A day after Robert Darling’s death his friend and comrade Captain Trumball Warren, who succeeded him to the post of adjutant and had played for the UCC in 1903, was killed by a German shell that landed in the Cloth Hall Square at Ypres. Before the bombardment the old city had been left largely undamaged and Warren’s 15th Battalion had been relieved that day, making his death unexpected. He was 29 years old. The wives of Captains Darling and Warren had sailed over to England to be closer to their husbands, and they returned to Canada on the same boat, the Transylvania. Cricketers from the Canadian fee-paying schools bore a disproportionately large amount of the sacrifice. One hundred and seventy-nine of the Upper Canada College’s former students were killed in the War and Lieutenant-Colonel William Marshall was both the most experienced ex-UCC cricketer to die and also the most militarily distinguished. He was a wicket-keeper batsman, who had played for Hamilton following his graduation from the UCC, scoring 58 against the touring Phoenix XI from Ireland. In 1910 he toured Britain with Toronto Zingari and scored 155 against the same opponents. He played for Canada against the United States in the International Series in 1898 and 1911. Marshall was a veteran of the Boer War, in which he served with the Canadian Mounted Rifles. In the Great War he was mentioned in dispatches serving with the 15th Battalion. He was the second in command at the second Ypres, but the commander, Lieutenant-Colonel John Currie, remained some distance from the front line during the conflict, leaving Major Marshall effectively in command. When Currie was sent home, to spend the rest of his life defending himself against charges of cowardice, Marshall was promoted to Lieutenant-Colonel and commanded the Battalion. He was killed by a sniper whilst inspecting the trenches on 19 May 1916. Highfield School in Hamilton lost nine of its cricketers to the war: one of these was Lieutenant Walter Marshall, who played for the school from 1902-4 and was William Marshall’s half brother. The Marshalls had played together with at least three teams: Hamilton Cricket Club, Toronto Zingari in the 1910 tour of Britain and Canada in the international match of 1911. Walter appears to have been the more talented player, representing Canada in 1908 and scoring 101 against the MCC in the Zingari tour. Lieutenant Walter Marshall died of his wounds on 4 October 1916, whilst fighting for the 3rd Battalion at the Somme. The Canadian Corps lost 5,828 men at the second battle of Ypres, most dying on 24 April 1915. The cricketing fraternity lost four men that day including Private Reginald Lawrence and Lance Corporal Arthur Lawrence, brothers who had played for Calgary Cricket Club. Both men were from the 10th Battalion and were killed at St Julien. They were descendants of William Lillywhite the great round arm bowler known as The Nonpareil, and father of John Lillywhite, who had toured Canada in 1859, producing scorecards from his portable machine wherever the team went. Arthur was the elder brother and, like many of the First Contingent, had served in the Boer War. Calgary Cricket Club would lose six team members to the Great War. Another cricketer to die on the 24th was the Bombay-born Lance Corporal Joseph Bell who had joined Rosedale Cricket Club in 1906 and had played for them annually. He was good enough player to represent Ontario on several occasions, which he did with some success, hitting 41 against the Gentlemen of Ireland in 1909 and scoring 84 and 87 not out against Eastern Canada. He was killed near St Julien fighting for the 3rd Battalion. In June 1916 the Canadian Corps lost and then recaptured the strategically important heights of Mont Sorrel. Major Wilfred Dobson was the most senior casualty of a successful repulse of an enemy counter-attack on 9 July. He had been born in Dulwich, South London and had played for Exeter College, Oxford. He had been captain of the Toronto Cricket Club in 1914 and Wisden states that he was the Secretary of the Club when he was killed. The War took a disproportionately high toll on the cricket clubs’ secretaries, which is surprising since for many clubs this role often would have been performed by someone too old for military service. Nevertheless, I have identified five Canadian cricket club secretaries killed in the War. Perhaps men who were prepared to volunteer for the position of secretary were also prepared to volunteer for risky missions! The successful assault on Vimy Ridge was of huge military and nationalistic importance: the Canadian Corps were fighting together as a unit for the first time, rather than supporting a British division, and, at the time, the taking of Vimy Ridge was the most successful allied action of the war in terms of ground won and weapons captured, becoming a source of great Canadian national pride. In the words of one veteran “we went up Vimy Ridge as Albertans and Nova Scotians. We came down as Canadians.” The victory came at a price, however, with approximately 3,600 Canadians killed. The attack began on Easter Monday 9 April 1917, a day that saw the deaths of four cricketers. Lieutenant John Manley was one of twelve former Ridley College cricketers to be killed in the war, but he was the only old boy who is recorded as having played for another club . He moved to British Columbia and represented Vancouver Cricket Club, before signing up with the 72nd Battalion in December 1915. He was killed on the first day of the assault with his Battalion on the left flank. His gravestone is on the western slope of Vimy Ridge above the village of Souchez, one of the fifteen special memorials erected to those believed to have been buried there. Lieutenant George Reid was one of two members of the Coquitlam Cricket Club of Vancouver lost to the War. Wisden described him as being a useful bowler, a hard hitting batsman and the best fielder in British Columbia. He was also killed on 9 April 1917, a day after his 32nd birthday. A few days later Private Charles Lipscomb became the second Cowichan Cricket Club member to be killed when he died of his wounds on 18 April 1917. Two days later the Australian-born Lieutenant Roderick Finlayson of Incogniti of Victoria also died of wounds, sustained whilst fighting for the 7th Battalion. The other two cricketers to be killed on 9 April were both Acting Majors: Charles Gwyn, formerly of the Highfield School cricket team in Hamilton, and Walter Curry another Upper Canada College old boy. Both men had enlisted at Valcartier. Major Gwyn was killed leading the B company of the 72nd Battalion to within fifty yards of its objective. He was mentioned in dispatches. Curry had contracted typhoid despite being vaccinated and was invalided back home to Toronto following the 2nd Ypres. He returned to the front and was promoted to Acting-Major in the 3rd Battalion. He was killed instantly, along with his batman, by an enemy shell whilst leading A Company in the early stages of the attack. Walter Curry was the only son of J Walter Curry KC and, along with Major Gordon Southam, he was one of the sixty-one members of the Royal Canadian Yacht Club to be lost to the War. Private Walter Cooper died on 12 April 1917, presumably of wounds as this was a day after his 4th Battalion from Ontario was relieved following the successful attack on Vimy Ridge. He had represented Canada four times in the international series with America at the turn of the century. He was 44 years old. After Passchendaele the number of cricketing casualties decreased, with only sixteen cricketers dying alongside their many comrades in 1918, as the Canadian Corps were repeatedly used as “shock troops” to break the enemy lines, especially during the last hundred days of the War. Cricketers tended to sign-up in the early stages of the war with most serving with the first contingent. By 1918 they had little left to give. "I'm terribly depressed this evening. Ferrie has been killed. He led his patrol out this afternoon, had a scrap, came back leading the others, then as they were flying along quite normally in formation, his right wing suddenly folded back, then the other, and the wreck plunged vertically down. A bullet must have gone through a main spar during the fight. The others went after him and steered close to him in vertical dives. They could see him, struggling to get clear of his harness, then half standing up. They said it was terrible to watch him trying to decide whether to jump. He didn't, and the machine and he were smashed to nothingness. I can't believe it. Little Ferrie, with his cheerful grin, one of the finest chaps in the Squadron. God, imagine his last moments, seeing the ground rushing up at him, knowing he was a dead man, unable to move, unable to do anything but wait for it. A parachute could have saved him, there's no doubt about that. What is wrong with those callous dolts at home that they won't give them to us?" Ferrie was posthumously awarded the military cross, possibly to placate his comrades. Dyce Willcocks Saunders and Robert Bown Ferrie had represented Canada and toured Britain together in 1887. They had shared many successes and trials on the cricket pitch; the War ensured that they also shared the tragic loss of their young sons. Lieutenant Thomas Saunders was the eldest son of Dyce Willcocks Saunders KC. Thomas Saunders played for Trinity College School in Port Hope from 1911-1914 and captained the side during his last two years at the School. He served in the 13th Battalion and was killed at Mont Sorrel on 13 June 1916, nine days after his 20th birthday. Saunders and Ferrie had another reason to grieve on 7 September 1916 when Lieutenant Colonel Coote Shanly, the Assistant Manager of the 1887 tour, died of a respiratory illness in Toronto after being invalided home in July. He had signed up at Valcartier where he was appointed the Canadian Expeditionary Force’s chief field paymaster. He was 53 years old. Another cricketer to lose a son was John E Hall who co-wrote the famous book “Sixty Years of Canadian Cricket” with Robert McCulloch. Hall had also represented Canada with Saunders in July 1891 against the Ontario Association. Captain George Hall had followed his father into the Toronto Cricket Club. Captain Hall died of his wounds on 16 June 1917 aged 21 in the Vimy area, during a lull in the fighting. Cricket in Canada has been sustained by the influx of cricket-playing immigrants, but it has been held back by the reluctance of the sons of immigrants to play an un-Canadian game. The War killed many Canadian-born cricketers, including at least three who had fathers that had represented Canada. The war indirectly led to a more independent, less British Canada, which inevitably contributed to the decline of cricket, as it was seen as a British game. The war also took a heavy toll on Canadian cricketers, as a disproportionate number of them signed up. Most had been born in Britain but well over a third had been born in Canada. The war killed off a generation of cricketers, many of whom could have succeeded in altering the perception of the game from a British pastime into a Canadian sport. (Johannesburg, April 19) Ireland coasted to a 9 wicket win over Canada in the ICC World Cup Qualifying Tournament Final. Former Irish captain Trent Johnstone almost halted the early promise in Canada’s batting in taking 5 wickets for just 14 runs from 10 overs. Canada drifted from 61 for 2 wickets after 10 overs to a disappointing 185 all out from 48 overs. Ireland’s current captain, opening batsman William Porterfield then took over, making 104 runs not out as his side overhauled the Canadian total with 45 balls to spare. Porterfield's innings included ten boundaries and came from 133 balls. He took part in an opening stand of 89 runs with G Wilson, who made 38 runs. Ian Billcliff caught Wilson off Sandeep Jyoti’s bowling. Wicketkeeper Niall O'Brien provided a supporing innings of 38 not out, and struck the winning run. Things looked promising for Canada when opener Geoff Barnett pulled Boyd Rankinès first ball of the second over for six and added two more boundaries before being caught at the wicket off Peter Connell. Asif Mulla was also looking promising but the entry into the bowling attack of medium-pacer Johnston turned the tiade. Not only did Johnston take five wickets, he took five of the top six in the batting order, His first victim was Rizwan Cheema, who made 8. Cheemad played a defensive shot that ballooned into the air and was caught. Mulla was leg-before wicket just 8 runs later, then Billcliff (10 runs), Sunil Dhaniram (7 runs) and captain Bagai (4 runs) fell in quick succession. Johnston at this point had taken 5 wickets for just 5 runs. He then caught Jyoti off the bowling of Rankin to leave Canada in serious trouble at 92 for 7 wickets. Umar Bhatti lead the late resistance, finding some support from Harvir Baidwan (14 runs) in a stand of 29 for the eighth wicket, and a promising 26 runs from Khurram Chohan (26 runs). Bhatti was fortunate to escape a couple of early ininngs chances, but battled away to make 46 runs from 111 balls. Bhatti made a slight dent on Johnston's bowling figures by striking two boundaries in Johnston's last over. Sadly, the Canadian innings came to a swift end with two run outs. Bhatti and Chohan ended up at the same end of the pitch, so Bhatti departed run out by the length of the pitch. Chohan then attempted a quick single off the next ball, and was given run out. Canada came second in the tournament and qualified for a place at Cricket World Cup 2011, but it was disappointing that the batting failed in the middle order for three matches in a row. Ireland looked solid for most of the match and have clearly progressed in recent years, fortified by reaching the Super 8 stage of CWC 2007. It was disappointing that only about 50 spectators were dotted around the ground, plus a further 50 or so in the main stand. Earlier in the day the teams had arrived at the ground before the gates to the changing rooms were open. But often there are stories from these games and tournaments away from the playing field. A few people in the crowd ended up with printed copies of the tournament program. But what a pity more resources cannot be found by the ICC to better support such events. A couple of local cricket enthusiasts were even talking of the potential that advertising the Final might have brought in a reasonable crowd and some revenue. It would be so much better for the players to gain experience in front of a sizeable crowd. One of the ICC's key points from "Our Mission, Vision of Success and Values" is "excellence". The brief expansion for “excellence” reads: "cricket's players and supporters deserve the best. It is our duty to set the highest standards." The answer to the ICC improving excellence might rest in the following the value for "teamwork"; as if they "work as a team as with unity of purpose, we maximize the effectiveness of our assets." But for now, too few people are left to support such events. What a pity. *** In the day's other matches, the Netherlands beat Kenya by 6 wickets in the match to decide 3rd place. Afghanistan beat Scotland by 89 runs to record its first win in an ODI match and take 5th place. The UAE beat Namibia in a reversal of the result earlier in the tournament to take 7th place. If there was any doubt that Ireland might take their foot off the pedal in an essentially meaningless final, Trent Johnston and his captain, William Porterfield, ensured they were focussed on the trophy as they thrashed Canada in the final of the ICC World Cup Qualifiers at Centurion Park. Johnston, whose nagging seamers cut through Canada with career-best figures, and Porterfield, who made an unbeaten 104, justified Ireland's standing as the No.1 Associate and the team to beat, as they have been all tournament. Eighteen days ago Porterfield stamped his and Ireland's mark on the tournament with a brutal 101 to beat Scotland. A little under three weeks later, he finished with another beautifully crafted and dominant innings. Chasing a meagre 186, he and Gary Wilson were solid and assured, laying down a base on which to launch their chase later in the innings. Wilson took advantage of anything short - there was plenty - smiting Henry Osinde over the top for six. He fell for a well-made 38, spooning to third-man, but Porterfield and Niall O'Brien then took total command. Ireland's captain has impressed many in this tournament, not just through his assured batting but his calm leadership. With O'Brien for company, he took apart Canada whose fielding regressed from reasonably proficient to, at times, hopelessly average. A fierce slap past point brought up Porterfield's fifty from 80 balls and the milestone prompted his charge against Sunil Dhaniram, who bowled far too short. The firmest of off-drives brought him a boundary, followed by an elegant pick-up over long-on as Ireland reduced the chase to nothing more than stroll in the park against a tired team already thinking of flying home. Porterfield aside, it was Johnston who really set up Ireland's convincing win with an outstanding display of swing and seam. His introduction in the ninth over from the West Lane end completely turned the match around and, with his sixth ball, he had Rizwan Cheema edging to Kevin O'Brien at first slip. In his next over, he trapped Ashish Mulla leg-before with one that skidded through low and Canada were tottering on 69 for 3 after wasting a positive opening stand. Alex Cusack kept things tight from the other end, but Johnston was a persistent threat and found a beauty which cut back on Ian Billcliff to bowl him through the gate. He then followed it up with two wickets in consecutive balls to record his first five-wicket haul in ODIs - and Ireland's best figures - leaving Canada in the hopeless position of 88 for 6. Ireland were well on top, though Umar Bhatti added 46 to at least help Canada post a total resembling competitiveness. Nudging singles off his pads and working the ball cleverly into the gaps at midwicket, he gradually began to build partnerships, putting on an entertaining ninth-wicket stand of 51 from 80 deliveries which at least made the total respectable. Ireland, however, came to South Africa not just to qualify for the World Cup but to get their hands on the trophy and, when O' Brien hit the winning runs with 7.3 overs to spare, at last they could truly celebrate their outstanding performance in Associate cricket's showcase event. The coaching staff imposed an alcohol ban on the Irish at the start of the tournament, even randomly breathalysing some of the players. Suffice to say, tonight's party will be very long, very hard and richly deserved. With World Cup qualification assured the final of the Qualifying Tournament was a battle for bragging rights as to associates nation. Canada, batting first after losing the toss, made a good start but the middle order collapsed due to an devastating spell from Trent Johnston. The Canadian lower order, thanks to 46 from Bhatti took the Canadians to 185 all out from 48 overs. A century form Porterfield took Ireland to an easy victory. Ireland won the toss and asked Canada to bat. Canada tried an new opening partnership of Mulla and Barnett, dropping Cheema to number three. The experiment seemed a success as both bats showed aggressive intent in taking the score to 36 in the 6th over. Barnett who had made 19, with a hook for six and two well struck fours, edged a catch to the keeper. Cheema lasted just 9 balls, edging O'Brien to slip. Mulla had made an entertaining 36 when an excellent delivery from Johnston trapped him in front, and Johnston bowled Billcliff shortly after. Johnston had taken 3/3 at that stage and Canada were 78/4. Dhaniram tried to break the shackles with an attempted big hit but was caught on the boundary; Bagai tried to cut the next ball and was caught at third man- 88/6 and 5/3 for Johnston. Jyoti struggled for a 14 ball duck, before trying to hook Rankin, top edging to fine leg, leaving the tail to try and bat out the remaining 25 overs. Bhatti ruined Johnston's figures taking two boundaries from his final over - but his final return was still an impressive 10-4-14-5. Bhatti and Baidwan put together a useful partnership of 39 before Baidwan (14) was lbw to Rankin,. Bhatti continued to bat well, passing his best one-day-international score, and with Chohan took the score past 150. Bhatti was run out for 46 with two overs to go, batting for 111 minutes and over half the 50 overs- he has shown evidence of developing into a true all-rounder in this tournament. He and Chohan put on 54, but the innings ended on the very next ball as Chohan was also run out trying to steal the strike. A century from Porterfield led Ireland to the most comfortable of wins- he struck 13 boundaries, accelerating smoothly after a slow start. Bhatti bowled economically, 10 overs for 23 runs, and Jyoti took the only wicket. Thus an excellent tournament for Canada finished with some disappointment with three consecutive losses. There's no doubt that Davison was a big loss for the second phase of the competition, plus the number of games in a comparatively short period was challenging. Canada should overall be delighted with their finish- this is the best of their performances in World Cup qualifying tournaments. The Netherlands won the toss and elected to bowl. (Johannesburg, Apr 18) Canada qualified to meet Ireland in the Final of the ICC World Cup Qualifying Tournament despite a 6 wicket loss to the Netherlands at the Walter Milton Oval on Friday (April 17). The Final will be at Supersport Park, Centurion on Sunday starting at 9.30 am (local time in South Africa), the ground where John Davison struck the then fastest century in Cricket World Cup history in 2003. Davison reached the century mark from just 67 balls. Davison underlined his desire to help the advancement of Canadian cricket by playing in this tournament, scoring one century before being forced out of playing due to a leg injury. But his experience and presence still count off the field, even through the frustration of not being able to play. Canada's innings of 205 for 8 wickets against the Dutch began with a bang and ended strongly, but the Dutch bowled well during the middle phase. Sandeep Jyoti (46 runs) and Umar Bhatti (39 not out) added 72 runs in 13 overs for the seventh wicket. Dutch openers Mudassar Burkhari and Alexei Kervezei responded with a stand of 167 runs that ended when off-spinner Jyoti bowled Kervezee for 77 in the 37th over. Left-arm spinner Sunil Dhaniram dismissed Burkhari for 84 in the next over with a catch off his own bowling.and took two more wickets to stem the Dutch march to victory.. These vital breakthroughs helped keep Canada in second place in the overall standings above both Kenya, who beat Ireland, and the Dutch due to a better net run rate. Canada, Kenya and the Netherlands each ended on 8 points from 4 wins. Ireland topped the standings with 5 wins and 10 points. These four teams qualify for the 2011 ICC World Cup and the next ICC World Cricket League Global Division One, as well as securing ODI status for the next four years, and ICC High Performance Funding. . The last day saw Scotland gain some consolation by retaining ODI status with a 122 run win over the UAE. Afghanistan completed the rise up from the depths of the Pepsi World Cricket League Division Five to securing ODI status in about one year. Afghanistan beat Namibia by 22 runs. Scotland, Afghanistan and the UAE each ended with 3 wins and 4 losses. Net run rate (NRR) again decided the Super 8 standings. Scotland's big win dented the UAE NRR. Namibia closed with a record of 2 wins and 5 losses. There is an increasing strength in the ICC Associate and Affiliate ranks. Several of the leading countries need more matches at this, or the higher level against Full Member Country A teams, as well as financial commitment, improved cricketing infrastructure and proper domestic development and marketing programs for this trend to be sustained and for cricket to become a better global sport. Clearly several countries would need more funding from government and the corporate world, Possibly a greater challenge in present global economic circumstances, but in the broader picture, the world can be a better place through people coming together in the true spirit of sport and cricket. How sad that so few people get to see how the players, coaches and officials mingle together and gain respect for each other at tournaments like this. The ICC has produced a nice Tournament Guide, but the printed version is not freely available at the hosting grounds. It is on the official website, but a book in the hand is worth much more than two or three trips to the bush of the internet. So Canada will be looking to go one better than in 1979 when it lost to Sri Lanka in the first ICC Trophy final. That event served as the qualifying competition for the Cricket World Cup. Canada has made progress since reaching the 2003 CWC, but as John Davison says in the current Tournament Program It s a bit disappointing that we havenèt progressed as much as we may have liked, but there has been some progression. A win for Canada on Sunday will, I am sure, spark greater interest. Perhaps it might bring in some new mowers for the various parks and grounds where cricket is played across Canada. Too few of the outfields used domestically are cut to the short length of grass, so techniques in batting and fielding can suffer. The first overseas tour by English professional cricketers was to Canada was in 1859. They noted fielding was not always up to par in Canada, and also linked this to the state of most of the outfields where they played. Grass wickets, grass net facilities, proper indoor facilities and more coaching are also on the needs list. It sounds like it has taken a long time for some of those involved in Canadian cricket to comprehend and act decisively on those issues. It has. It s time to deliver. Hopefully with a Canadian win at Centurion Park on Sunday but certainly with a dynamic action program off the field. In the final match of the super 8 round, Canada batted poorly and lost to the Netherlands by 6 wickets. The Netherlands assured themselves of a World Cup spot with the win, but Canada will play Ireland in the tournament final on Sunday, staying ahead of Netherlands on net run rate. Canada were put in to bat by the Netherlands and faced an uphill struggle after the top five batsmen were all dismissed in the teens. An excellent 7th wicket partnership between top-scorer Jyoti and Bhatti allowed them to pass 200. Kervezee and Mudassar Bukhari put on 167 for the first wicket, and despite late wickets from Dhaniram came out easy winners. Netherlands are desperate for a win to bring them into a tie with Canada on 8 points, and were without star all-rounder Ryan ten Doeschate - who had taken 2-92 for Essex yesterday. Osinde returned at the expense of Bakaji Rao, and Mulla replaced Kandappah but the side was otherwise unchanged from the one that lost to UAE. When Netherlands asked Canada to bat, they made Canada's place in the top four all but certain, as mathematically even with a lop sided loss it would be hard for the teams chasing them to pass them on net run rate. Cheema lasted just 6 balls but managed 15 runs from them with three boundaries. Barnett and Mulla took the score to 44, but then both were dismissed in rapid succession. Billcliff contributed a big 6 in his 17, then Bagai was caught behind chasing a wide delivery - 88-5. The failure of the top five to build a substantial innings after getting into double figures put tremendous pressure on the remaining batting. Dhaniram and Jyoti batted steadily to pass the century mark after 30 overs. Dhaniram became the first Canadian to pass 20, and was starting to push accelerate when he was caught behind for 33 - 132-6. Jyoti and Bhatti constructed an excellent partnership of 72, taking 46 off the last 5 overs and allowing Canada to pass 200. Bhatti made 39*, including a massive six over mid-wicket, and Jyoti was run out in the final over for an invaluable 47. Canada's final total was 205/8. Netherlands had to bat for 6 overs before the lunch break, and knowing that net run rate would be important went into the attack right away. Mudassar Bukhari started coming down the wicket to Osinde and hit Bhatti for a big six over mid-wicket. At lunch they were 27/0 off six overs. The run rate slowed somewhat for a period after lunch (it took Mudassar Bukhari 7 overs to score another run after the lunch break), and Bagai dropped a hard chance standing up to Bhatti who was bowling well. With both bats looking increasing comfortable the runs began to flow, particularly from Kervezee, who hit some splendid drives, reaching his third successive half-century in the 22nd over. The hundred, then hundred and fifty partnership marks were passed with little prospect of a wicket. The breakthrough finally came when Kervezee was bowled by Jyoti for 77, and the partnership had reached 167. As so often happens in a big partnership, Mudassar Bukhari followed in the next over, caught and bowled by Dhaniram for 84. van Bunge lasted one ball- lbw, leaving Dhaniram on a hat trick. Szwarczynski survived the hat-trick ball but was lbw shortly afterwards- Dhaniram had three wickets. The Dutch had no further troubles and passed Canada's total with 2.5 overs to go. Netherlands were thus tied with Canada on points but behind on net run-rate, leaving Canada in second place. Kenya beat Ireland by 6 wickets and also ended up on 8 points but again were behind on net run-rate. Thus this Canadian squad have not only achieved their pre-tournament objective of World Cup qualification, but will be playing in the tournament final. Losing their last two matches is disappointing but excellent performances earlier in the tournament reaped their reward. They will be joined at the World Cup by Ireland, Netherlands and Kenya. Afghanistan- the team of the tournament for many- ensured one-day international status with a win over Namibia- a powerhouse in the Intercontinental Cup but a disappointment in this competition. Pre-tournament favorites Scotland kept one-day status with a win over UAE, and will play the Afghans for 5th-6th place. (Krugersdorp, April 15) The United Arab Emirates (UAE) cashed in on a sub-par performance from Canada to win by 5 wickets with almost 19 overs to spare at Krugersdorp on Wednesday (April 15). Ireland remain top of the Super 8 league table with 5 wins and 1 loss after a six wicket win against the Netherlands. Canada (4/2) is still second, despite the loss to the UAE, and closes this phase of the ICC World Cup Qualifier against the Dutch on Friday. The top two teams meet in Sunday’s Final at Centurion. Namibia blitzed to a 201 run win over Kenya. Jan-Berry Berger (125 runs) and Raymond van Schoor opened the Namibian innings with a stand of 191. Namibia reached 305, then bowled out Kenya for just 104. Karim Sadiq (92 runs) lead Afghanistan to a total of 279 against Scotland, who replied with 227 all out. These results leave the battle for the four World Cup 2011 places dependent on Friday’s final round of Super 8 action. Canada began with some solid shots from Rizwan Cheema, who struck a breezy 20 runs from 17 balls before being caught at deep square leg in the fourth over, and seemed on course for a good score with Geoff Barnett and Sandeep Jyoti batting well. But a call for a quick single in the 20th over saw Barnett run out, and proved the turning point of the innings. Incoming batsmen then struggled against the UAE spin bowlers. The run rate subsided with just 25 runs scored and 5 wickets falling in the next 13.3 overs. A last wicket stand of 43 runs in 6.2 overs between Balaji Rao Dorkanti and Khurram Chohan averted a complete subsidence of the Canadian innings. It was also thought to be a score that could be defended on a slower wicket than others in this tournament. Balaji Rao struck 4 fours and drove two sixes over the fielder at long-off in a plucky 39 runs from 34 balls. Opener Barnett also made 39 runs, mixing singles with some good boundary strokes. He and Jyoti had added 73 for the second wicket when Barnett was run out attempting what now seems a fateful quick single. Jyoti top-scored with 43 runs, striking 5 fours and a six in a stay of 96 balls. UAE spinner Saqib Ali had the impressive figures of 3 wickets for 20 runs from 10 overs. Khurran Khan chipped in with 2 wickets for 23 runs from 9 overs. UAE responded with some fireworks as Amjab Javed struck the opening ball of the innings to the cover boundary for four and blasted the first ball of the second over for six over deep mid wicket. Ironically Javed fell to a catch of the bowling of Cheema, Canada’s blitzkrieg opening batsman. Javed made 40 runs off 23 balls with 5 fours and 3 sixes The UAE had reached 70 for the loss of 2 wickets from just 8.5 overs. Canada was without Henry Osinde in this match. Khurram Chohan came in for some tough punishment as the UAE powered along, aided by some missed chances, fielding errors that cost more runs and the game became a real struggle as confidence disappeared. On a good day, some of the balls struck in the air would have been caught. On Wednesday, with a couple of artificial hills created from gold mining in the background, any gold belonged to the UAE batsmen. Khurram Khan was named Man-of-the-Match for his 53 not out (seven boundaries) as well as two wickets. Nithin Gopal and Saqib Ali each scored 37 runs. Saqib Ali was in contention for the Man-of-the-Match award due to his fine spell of bowling. Sameer Nayak sealed victory for the UAE with a six. The UAE camp was ecstatic. The Canadian camp was left really disappointed. In a match that could have assured them of World Cup qualification, Canada's middle order collapsed after choosing to bat against UAE, losing 6 wickets for 25 runs after a promising start. Only a last-wicket partnership of 43 from Balaji Rao and Chohan allowed them to post 194. UAE had little trouble passing Canada's total with 18 overs to spare, but Canada still look to be in a strong position to advance to the World Cup. Bagai won the toss again and this time chose to bat. Osinde and Mulla were left out, with Kandappah and Balaji Rao brought in. Cheema contributed what seems to becoming a trademark cameo- 20 runs off 14 balls with three fours and a six. Barnett (39) and Jyoti (43) took the total to 97, when Barnett's run out preciptated a middle order collapse. The heros of the Afghanistan match, Billcliff and Bagai contributed three between them, Dhaniram another 3, and when Jyoti departed Canada had lost 5 wickets for 23 runs. Kandappah managed 1 from 13 balls, and 97/1 had become 122/7. Bhatti and Baidwan put on 22 in 8 overs, before Bhatti fell for 10. 14 from Baidwan took Canada past 150, but Khuram Khan took his second wicket, leaving Canada's last pair to try and bat out the 8 overs remaining. Balaji Rao and Chohan did well however, Rao (39) striking six boundaries in an invaluable partnership of 43. UAE got off to a flying start, needing not only to win but also to improve their net run rate, and then cruised towards a comfortable victory. UAE's only hope of advancing to the World Cup was by drastically improving their net run rate so needed to pass the Canadian total in as few overs as possible. Amjad Javed set the tone with a 6 in the 2nd over; but Chohan had Arshad Ali caught in the 4th over. The boundaries started to flow - Nithin Gopal with four in two overs, then 29 more runs came off the next two as Amjad Javed hit two more sixes. He was caught off Cheema having made 40 from 23 balls. Balaji Rao was introduced but went for 20 runs from 2 overs as UAE continued to attack. Gopal made 37 from 35 balls before Jyoti had him lbw. Dhaniram and Jyoti slowed the run-rate for a while - Dhaniram even bowling a maiden but with victory in sight, the UAE bats started to attack again. Bhatti bowled Saqib Ali (37) and Jyoti picked up a second lbw victim, but UAE only needed another 17 runs. Captain Khuram Khan completed a half century to go with his 2 wickets and run-out and they won with 18.4 overs to spare. Despite the loss, Canada still look assured of a top four spot and World Cup qualification. Kenya went down to a heavy defeat to Namibia, not helping their net run-rate. It looks as though Ireland will defeat the Netherlands, and if Scotland beat Afghanstan, Ireland will have 10 points, Canada 8, and four teams tied on 6 points going into the final round of the Super 8s. Two of those teams play each other- Scotland and UAE. In the worst case, Kenya beat Ireland, Canada lose to Netherlands, and the Scotland UAE match is lop-sided allowing one team to improve their run-rate. This would leave Canada, Kenya, Netherlands and Scotland or UAE tied on 8 points - four teams looking for three spots. Of those teams, Canada's net run rate is by far the best, and only the most unlikely series of very one-sided matches would allow three teams to pass Canada. Veteran Ian Billcliff was named Man-of-the-Match as Canada chalked up a closely fought win over Afghanistan in Pretoria on Easter Monday. Billcliiff struck 96 not out, just missing out on a century, but he was among those delighted as a mighty drive for 6 in the 49th over by Sunil Dhaniram took Canada to the brink of success. Next ball, Canada won with 6 wickets and 9 balls to spare. It was smiles and congratulations all round in the Canadian camp. Afghanistan had applied some pressure with a couple of tight overs, but the brave effort from the Afghans was not quite enough. The match was played in good spirit on a pitch conducive to run scoring. The kind of surface where 5 or 6 runs an over are needed to win matches, if not more. Canada won the toss and put Afghanistan in to bat. Steady progress was made by the Afghans in the early going, who reached 39 before losing a wicket in Khurran Chohan s first over, the ninth of the innings. Rizwan Cheema, like Chohan a medium-pace bowler, also struck in his first over, the sixteenth, making Afghanistan 69 for 2 wickets. Norooz Managal, the captain, then joined opening bat Noor Ali in what proved the major stand of the Afghanistan innings. Noor Ali was dropped at slip, by Billcliff, but otherwise played well and the third-wicket duo began to score freely. Canadian captain and wicketkeeper Ashish Bagai tried changing his bowlers and eventually Cheema made the breakthrough. Mangal was caught by Bagai, his third catch of the innings, and Mangal departed for 49 runs. His compiled his runs from 69 balls, with 3 fours and one six. The run scoring pace was further reduced as two wickets fell in quick succession. There is always the prospect that the fall of a wicket may lead to further rewards in one-day games, especially at this level where some of the players do not face strong opposition on an ongoing basis. First new batsman Asgar Stanikzal called for a run that Noor Ali did not think could be made. Stanikzal was ruled run out, but Noor Ali had left the safety of the crease and was fortunate not to be the player deemed run out. Cheema trapped Mohammad Nabi leg-before wicket and a happy transformation had begun for Canada. The third-wicket pairing had added 118 runs in about 20 overs, but 187 for 3 wickets had slipped to 189 for 5 within a couple of overs. Noor Ali found a willing partner in Rais Ahmadzal, and the pair carried the score to 233. Noor Ali led the way, reaching his century and showed dominance until he was run out. Ahmdzal soon followed for 18 runs, made off 23 balls. Samiullah Shinwari included a well-struck 6 in making 15 runs from 8 balls included a well-struck 6 and the innings closed on 268 runs for 5 wickets. It was a few more runs than Canadian coach Pubudu Dassanayake wished to see Afghanistan make, but was still a reachable target on a batsman friendly pitch. Cheema took 3 wickets for 41 runs in 10 overs. He bowled one of only three maiden overs in the match. The Canadian innings began at fast pace. A couple of the early boundaries from Cheema came from the edge of the bat and sped past the wicketkeeper. But all runs count, and one old theory is you pay for the edge of the bat, as well as the meat of the bat, so why not make some runs off the edges. The meat of the bat began to be applied, and opening partner Geoff Barnett played a couple of quality strokes to put Afghanistan under pressure. The spin bowlers were introduced, with immediate success, to try and counter the fast scoring. Barnett was bowled by Shinwari for 19 in the ninth over, then Cheema ballooned a ball from Mohammed Nabi to long-on and was caught for 46. Thus in the space of seven balls, Canada remained on a total of 67 runs but lost two wickets. Cheema s 46 came from 23 balls with 8 fours and 2 sixes. Asif Mulla, batting third, struck a glorious shot to the cover boundary for six, but the promise of a good innings went as he was leg-before wicket for 16 with the total on 96. Billcliff was joined by captain Bagai in what proved the partnership that steered Canada towards the victory mark. The reaction from fellow members of the squad began to warm as the stand reached 50, was distinctly hot as the pair passed the century stand and the hope of a win was turning to certainty. A couple of useful overs for the Afghans was capped by Bagai being bowled, trying to make room to steer the ball to the fine-leg boundary. Billcliff removed some of the tension with a drive for six to the long-off boundary and left-hander Dhaniram delighted the Canadian contingent with a drive for six to long-on in the 49th over. He steered the next ball through the leg-side field and thust his arms and bat into the air after completing the winning run. Dhaniram also struck a four in plundering 15 runs from six balls.and Billcliff was left on 96 not out. Runs made from 114 balls, mixing judicious singles and twos that kept the score ticking over, with eight fours and two sixes. Just before the 2007 Cricket World Cup, Billcliff made it into the 90 s in an ODI against Bangladesh which Canada lost by just 13 runs. Perhaps, some day soon Billcliff will gain the reward of a century for Canada in a one-day match as a reward for his efforts on behalf of the country of his birth. Billcliff lives in New Zealand, where he played most of his cricket. He, like the rest of this squad, will be looking for a win on Wednesday against the United Arab Emirates that would take Canada to 8 points and an almost certain place in the top four of this tournament. A placing that brings a spot in the 2011 Cricket World Cup. It is time for focus on one-game-at-a-time. There is always the chance that the UAE batsmen might have a good day, but Canada has a good mixture of players scoring runs and a bowling line-up with variety and depth. A mature and bruising 96 from Ian Billcliff helped Canada maintain their impressive form at the top of the table, beating Afghanistan by six wickets on a stiflingly warm day at the picturesque LC de Villiers Oval in Pretoria. Afghanistan's confidence seemingly knew no bounds before today. Prior to this tournament, they didn't simply aim to reach the 2011 World Cup: they expected to. This watertight belief in their own ability has won them fans, and matches - epitomised by their romantic victory over favourites Ireland two days ago. Today was a much-needed lesson in lessening their expectations to something a little realistic, and confirmation that dreams are made and squashed on the pitch. Afghanistan's hopes of reaching the World Cup are now practically over. They nevertheless stood shoulder-to-shoulder with Canada for most of the match, and their defeat came in spite of a fine 122 from Noor Ali, the cornerstone of Afghanistan's impressive-reading 265 for 8. The pitch, however, has produced scores in excess of 300 this season and again, today, it offered little seam or swing to trouble the batsmen, though Canada did reduce their opponents to 69 for 2. Ali and his captain, Nowroz Mangal (49 from 69), then steadied Afghanistan in a patient third-wicket stand of 118, taking advantage of Canada's surprisingly poor fielding. Henry Osinde's hapless fumble at fine-leg produced roars of disappointment from the injured John Davison on the boundary-edge, and the bowler later dropped the dolly of all dollies off his own bowling. Yet they fought back impressively in the second half of the innings and, after Ali brought up a compact 127-ball hundred, Afghanistan began to implode, losing 3 for 2 in 13 balls as Rizwan Cheema bowled a disciplined line and nagging length. The tail failed to wag, though that Afghanistan managed to reach a total in excess of 250 represented a recovery of sorts. Canada then got off a flier with Geoff Barnett and Rizwan Cheema smacking 67 in eight overs of batting that snapped Afghanistan's rather brittle confidence in half. Hamid Hassan, who blitzed Ireland two days ago, was taken for 32 in three surprisingly wayward overs while Mangal was introduced into the attack and promptly thwacked out of it, conceding 19 from his two overs. Cheema, a compact batsman, flicked four over midwicket and two further sixes to boost Canada's run-rate. Afghanistan fought back with three quick wickets but then Billcliff took over in an uncompromising display of power hitting, cracking eight fours and two huge sixes. Karim Sadiq persisted in dropping it too short and, with Billcliff spending most of his innings on the back foot, was subsequently hammered. Not content with carving over extra cover, he was just as adept at nudging twos past mid-off to keep the score ticking over, and he ran Afghanistan ragged. Seventy-seven were needed from 78 and alongside Billcliff was Ashish Bagai, the pair putting on a match-winning stand of 148. All three of Bagai's fours were cleanly struck, but his uppercut for six over third man really stole the show as the asking-rate dipped from tricky to facile - 58 from the final ten overs. The raucousness with which Canada celebrated was justified and understandable. They are marching into the final four and that cherished World Cup spot. Canada seem almost certain to qualify for the next World Cup after beating Afghanistan by 6 wickets. Afghanistan, who posted an excellent score of 265 after Canada put them in to bat. They were led by an excellent 122 from opener Noor Ali. Barnett and Cheema got Canada off to a flying start in reply, taking 67 off the first eight overs, and then a fine partnership between Billcliff and Bagai took Canada within sight of victory. Man-of-the-match Billcliff finished unbeaten on 96. Canada are top of the Super 8 table, and only an unlikely sequence of results now can see Scotland or UAE pass them for fourth place. Both teams came into this match with confidence high after big wins against Kenya and Ireland in their first Super 8 games. There were no changes in the Canadian team, and Bagai won the toss and chose to field. For once the opening attack of Osinde and Bhatti failed to make a breakthrough, and it was first-change Chohan who induced a catch to the keeper from Karim Sadiq. Bagai also caught Mohammad Shehzad off Cheema, but Afghanistan, led by Noor Ali were accumulating runs at over 4/ over. Noor Ali, averaging 9 in the tournament to date, advanced to his half-century, and with captain Norooz Mangal put together a century partnership for the third wicket. Canada made a much needed breakthrough when Norooz Mangal (49) edged Bagai a third catch off Cheema, and Billcliff ran out Asghar Stanikzai without further addition to the score. Cheema struck again, trapping Mohammad Nabi leg-before, and Aghanistan had lost three wickets for two runs. Nor Ali completed an excellent century, from 127 balls, made out of 198. He was run out for 122 (8 x4, 1x 6). Chohan and Osinde took wickets as the overs wound down but Afghanistan's final total of 265/8 was a challenging one. Canada would have to bat well against a decent attack to prevent another Afghan upset. The Netherlands, beat Namibia, thanks to an unbeaten innings from ten Doeschate - he flies to the UK to join Essex this evening and will play no further part in the tournament. Ireland comfortably beat UAE, and Scotland narrowly lost to Kenya. Canada top the points table on net run-rate, tied with Ireland on points. Netherlands are 2 points behind, tied with Kenya. The two teams on four points, Scotland and UAE are far behind Canada on net run rate, and only some lop-sided results could see them tie with Canada on points and pass them on net run rate. Canada can now realistically set their sights on a place in the final with a win over the Dutch. Canada play UAE on Wednesday, 15 April. Canada got off to a fantastic start as the Super 8s got underway with a 7 wicket win over Kenya- with nearly 15 overs to spare. Canada's new-ball bowlers had reduced the powerful Kenyan batting lineup to 71/6 - Kamande and Odhiambo provided Kenya with some respectability but a final total of 181 was well below par. Canada knocked off the runs with little trouble after Cheema got them off to a flying start with 49 from 24 balls including 5 sixes. Their hopes of World Cup qualification were boosted further when all their main rivals lost in a series of upsets. Ashish Bagai finally won a toss and made the wise decision of asking the Kenyans to bat. Asif Mulla came into the team, a forced replacement for the injured Davison, and Baidwan was also included for Katchay. Henry Osinde, perhaps helped by some injudicious batting from the Kenyans took four wickets in his opening spell, Otiento and Obanda edging short pitched balls to the keeper, and then getting the classy Tikolo to edge a catch to Jyoti in the gully. Bhatti got into the act as another Bagai catch got rid of Obuya, then Osinde dismissed Ouma to leave Kenya reeling at 51/5. Osinde took 4/39 from 10 overs. A change of bowling yielded an immediate wicket when Chohan's fourth ball gave Bagai his 5th catch of the innings. After 20 overs Kenya were 82/6. Varaiya and Kamande formed something of a recovery with a cautious partnership of 34 in 13 overs before Dhaniram had Varaiya lbw - 106/7 after 29 overs. Kamande was still there, and played a useful innings, and with Odhiambo helped the Kenyan total towards respectability- yet again Canada seemed to have an opponent on the ropes but failed to deliver the knock-out punch. The absence of a steady spinner to replace Davison was apparent as 10 runs came from Baidwan's only over and Jyoti was hit for 15 off his fourth over. Kamande completed an invaluable half-century, and Kenya seemed set for a 200 plus score at 175/7 with 8 overs to go. The partnership was broken after it had reached 72 when Chohan yorked Kamande for 61, and Cheema finished off the innings by dismissed Ongondo and Onyango in the next over - all out 181 in 43.5 overs. Cheema announced his intent in the first over, lofting the fourth ball far over long-off for 6. A second six to mid-wicket followed, and then three consecutive sixes to mid-wicket and long on took Canada to 40 from four overs. He had made 49 out of 61 when he was finally caught. Mulla contributed a couple of boundaries before being caught. Barnett made an accomplished 38 before being bowled but then Bagai (40*) and Billcliff (36*) crusied to victory- Bagai punctuating the win with a 6 to take Canada past Kenya's total. Canada thus already has six points in the Super 8s, with a commanding net run rate. One more win in all probability will ensure them of a top four finish, and two will put them in contention for the tournament final. Their next match is against Afghanistan on Monday, who pulled off the upset of the tournament in defeating Ireland today - they will mount a serious challenge to Canada. The Netherlands- tied with Canada at the start of the day, also lost to Scotland, and UAE are almost certain to lose against Namibia. This leaves Canada and Ireland tied on points at the top of the table (Ireland ahead on head-to-head results but behind on net run-rate); Kenya, Scotland, UAE and Netherlands on four points; and Namibia and Afghanistan on two. Canada have passed their first tests of the World Cup Qualifier with flying colours, entering the super 8s with 2 wins, and an excellent net run rate. One Day international status seems assured, but qualification for the World Cup will remain challenging. Canada has shown some excellent batting form with Bagai, Barnett, Davison and Dhaniram all making big scores and the opening bowling pairing of Bhatti and Osinde is looking the best in the tournament with excellent support from Chohan. Bagai has captained well- apart from his inability to win a toss. The loss of Davison through injury is a big blow, and Canada has had difficulty finding an economical fifth bowler. The fielding was poor in their one loss to Ireland, but overall the team has come together well, and the coaching team deserves full credit for preparing the team well over the winter. Canada have four more matches to play – plus play-offs but these are purely to determine overall rankings, World Cup qualification will be decided by then. Of the eight teams remaining, Ireland are unbeaten and seem certain to be in the top four. Three other teams are tied with Canada on four points- Kenya, Netherlands, and UAE – and these form three of Canada’s four opponents in the Super 8 round. Thus Canada’s fate is in their own hands. Canada’s first opponents, Kenya have an excellent Net run rate, and all sorts of experience. Their loss to Netherlands seems somewhat of an aberration, and Canada will have to do something special to beat them. The Kenyans have a strong batting line up, led by Tikolo and Otiento, complimented by a strong bowling attack, with excellent seam and spin options. That said, Canada have defeated the Kenyans in the past, and a win in this first game would be a huge step towards qualification – and perhaps even the tournament final. Their second match is against the surprising and improving Afghanistan team, who are probably out of the running for World Cup qualification, but have shown themselves to be very capable of upsetting good teams. Canada must and should win this match, setting up what likely will be critical matches against Netherlands and UAE. Netherlands beat Canada fairly comfortably in a warm-up match, but will be without their star all rounder ten Doeschate who has surprisingly chosen to return to England to play for Essex after the first two matches of the Super 8s. This will be a very close match, with a lot on the line. It’s possible that a top four place will be secured already by the time Canada play UAE, but this again may be a decisive match. UAE beat Netherlands and Afghanistan, and Canada’s matches against them over the years have often been exciting affairs. UAE have a couple of excellent batsmen in Saqib Ali and Amjad Javed, and seamer Zahid Shah has taken a lot of wickets in the tournment. Our prediction- Canada will lose to Kenya, beat Afghanistan and UAE- and the match with Netherlands is too close to call. If they make the top four, it will be on net run rate. The ICC has confirmed the technical committee of the World Cup Qualifier 2009 has approved three replacements for injured players for the tournament, which continues until 19 April in South Africa. Gordon Drummond replaced Gordon Goudie in the Scotland squad, Ashif Mulla replaced John Davison in the Canada squad and Phil Eaglestone replaced Andre Botha in the Ireland squad. The three players were ruled out of the tournament because of injury. in the tournament with 223 runs at an average of 46.60. His highest score was 131 which came in the win over Namibia. Davison also has 2 wickets and a catch. Cricket Canada has applied to the tournament technical committee, for Davison to be removed from Canada’s squad as he is no longer able to participate in the tournament and a replacement will be named shortly. Canada’s next game is Saturday April 11 against Kenya. Canada’s cricketers rebounded from Monday’s loss highly-fancied Ireland with a thumping 148 run win over Scotland. John Davison and Geoff Barnett gave Canada a solid start with an opening stand of 59 runs.. Scotland struck back as Craig White took 3 quick wickets, but Canadian skipper Ashish Bagai and Sunil Dhaniram turned the tide with a stand of 81 runs for the 4th wicket. Dhaniram departed for 41, but Bagai kept going to reach 87. Canada’s innings closed on 252 runs for 7 wickets. Opening bowlers Umar Bhatti and Henry Osinde soon underpinned the Scottish innings. Bhatti took 3 wickets for 31 runs and Osinde 2 for 14 as the Scots slumped to 33 for 5 wickets. Colin Smith battled away to reach 43, before being bowled by Rizwan Cheema. The innings fizzled out in the 31st over on just 104 runs. Canada closed its Group A matches with 4 wins and a loss to Ireland, The Irish beat Namibia by 7 wickets with 5 overs to spare to complete 5 wins in 5 matches. Scotland also progress to the Super 8 phase, winning 3 games, but losing to Ireland and Canada. Three teams in the group ended with 1 win and 4 losses. Namibia (1/4) squeezed into the Super 8’s on net run rate ahead of Uganda and Oman. Three teams closed with 4 wins and a loss in Group B. Kenya, who romped home by 9 wickets against Denmark on Wednesday, topped the Netherlands and the UAE on net run rate. Afghanistan continued to rise up the ICC Associate and Affiliate rankings by taking the fourth spot from this group in the Super 8’S. The Afghans won 2 and lost 3. Bermuda, who caused excitement on that island by playing in the 2007 ICC Cricket World Cup, recorded just 1 win over Denmark. These two countries will battle for 9th-12th places with Uganda and Oman. The Super 8 phase begins on Saturday. Canada is due to return to Willowmoore Park, Benoni, to face Group B winners Kenya. Canada must look to repeat the ODI success against the Kenyans that closed an Associates Tri-Nations January 2007 event in Mombassa. A win over Kenya would really bolster Canadian confidence. But everything comes down to doing things right on game day, and try to put thoughts of what might have been behind them. Canada then faces Afghanistan (Apr 13, Pretoria), UAE (Apr 15, Krugersdorp) and the Netherlands (Apr 17, Univ of Witwatersrand). Ireland carries 6 points from wins over the three Super 8 qualifiers from Group A. Canada, Kenya, the Netherlands and the UAE each bring two wins forward. Scotland will be looking to re-group having just one win to carry forward. Afghanistan and Namibia failed to beat any Super 8 qualifier in Group action, but both might yet have one or more good days. Some things might go wrong during a match, but a shock performance, good or bad, can significantly tilt the scales. The top four teams in the Super 8’s qualify for Cricket World Cup 2011. Canadian coach Pubudu Dassanayake has neatly rotated players in the early matches. There is a strength and resilience in the Canadian side. There usually is on the road. It’s no little achievement to have done so well, with several in the squad playing out of season. Canada played Scotland, knowing that a win will put them in a good position for World Cup qualification. Canada seemed to be in some trouble at 73/3 with Davison retired hurt, but a captain's innings from Bagai took them to 252/7 from their 50 overs. The Scottish batting could not cope with the new ball attack of Osinde and Bhatti, and Canada came away with a a critical win by the big margin of 148 runs. Scotland won the toss - Bagai thus losing the toss in all five group matches - and put Canada into bat. Canada brought in Katchay for Balaji Rao, and also changed their opening pairing, promoting Barnett to accompany Davison. This seemed a good move as they put on 59 for the first wicket in 11 overs, before Barnett was stumped. Cheema lasted just 3 balls in the number 3 spot, being lbw to Wright. 4 balls later, Davison who had made 31 from 33 balls with four fours and a six retired hurt with a leg injury, leaving Canada in a spot of trouble. The run rate slowed, as Wright who had taken both wickets bowled consecutive maidens. When he dismissed Billcliff he had bowled 4 overs, taken 3 wickets and conceded one run- a wide (his final figures were 3-23 from 10 overs). Dhaniram and Bagai took few risks as they rebuilt the innings. They put on 81 before the partnership was broken - Dhaniram (41 from 70 balls) was bowled by Stander. Bagai completed a valuable half-century with a six over long on and continued to accelerate. Jyoti made a useful contribution with a quick 16, and when he was out Davison returned with a runner. He added just one before being caught at third man. As the end of the innings loomed, Bagai hit four boundaries in six balls but fell for an excellent 91 in the penultimate over, trying to clear the ropes. 14 runs from the final over, including a big six from Chohan took Canada past 250, and to a defendable total. Scotland got off to a rapid start, but were pegged back in Bhatti's third over, when both Hamilton and Coetzer were caught behind. The dangerous Watson holed out at deep square leg in Bhatti's next over and Scotland were 29/3, which soon became 29/4 when Osinde had Poonla caught at slip. McCallum had scored 334 runs in the tournament to date but had made just 1 when he edged Osinde to slip - 33/5 and Canada's opening bowlers had put them on course for a vital win. Smith and Stander provided some resistance, but Chohan had Stander caught behind, and then a mix-up gifted Canada a seventh wicket with a run-out. A bowling change brought the 8th wicket, and Bagai's fourth catch as Blain edged Dhaniram to the keeper - 94/8 with over half the overs gone. Cheema got into the act as McLeod was trapped lbw and he finished off the innings when he bowled top scorer Smith (43). Bagai was named man of the match and will now lead Canada in the Suer 8s round, knowing that just two wins could see Canada into the World Cup. They will face tough opposition in Kenya, and the Netherlands have been in excellent form. The third and fourth place teams in Group B look like being UAE and the surprising Afghanistan, and although these teams cannot be considered anything other than challenging opponents, Canada on form look good to challenge for a top four spot. Canada as second place finishers in Group A play Kenya on Saturday April 11, the 4th place finisher in Group B on April 13, 3rd place finisher on April 15, and 2nd place Netherlands on the 17th. Kevin O’Brien and Eoin Morgan rescued Ireland from a precarious position to maintain their team’s 100 per cent record in the ICC Cricket World Cup Qualifier with victory over Canada at Benoni today. Coming together with the score on 40-4 chasing 221 for victory, O’Brien and Morgan batted cautiously in the early stages as Henry Osinde and Umar Bhatti made them work for every run with some tight and, at times, intimidating quick bowling. But the pair gradually grew in confidence, a process that turned out to be inversely proportional to Canada’s morale and by the time O’Brien smashed the winning boundary straight down the ground with six wickets and nine overs to spare, the body language of Ashish Bagai’s men was that of a comprehensively defeated team. O’Brien finished unbeaten on 89 (off 104 balls) and Morgan was 84 (off 100) as the Irish collected another two points to finish the day as they started it – on top of Group A. Afterwards, Morgan said he was not worried when the score was 40-4. “To be honest I was pretty calm about it. I knew it was a good wicket – that was quite evident from the first innings – so I knew if I built a solid base, I could be there at the end. “Kevin and I compliment each other quite well at the crease. He is an aggressive player who hits boundaries pretty much anywhere he wants to while I like to accumulate my runs so it was a good partnership. The right-left combination worked well, especially as the wicket wasn’t turning. The spinners found it very difficult to settle and then we made it difficult for them at the end. Previously unbeaten in the tournament the Canadians knew they did not have enough runs on what was a good batting surface. Geoff Barnett (49), John Davison (41) and Ian Billcliff (38) all got good starts without being able to capitalise, especially considering the Irish fielding early on was uncharacteristically loose as they dropped four catches and missed a stumping. But Canada coach Pubudu Dassanayake remained upbeat afterwards, comfortable in the knowledge that his side was already through to the Super Eight stage. “In the morning when we were batting we got a good start despite a bit of juice on the wicket early on but then we didn’t go through well. We lost a bit of momentum and then Ireland put pressure on us to restrict our scoring. “But we will regroup after this and come back well in our next game against Scotland. We are capable of beating them. We are still very confident we come back hard and collect those two points to bring through into the next round,” he said. Elsewhere, a remarkable innings of 164 from Amjad Javed (off just 117 balls, 17 fours and eight sixes) made sure the UAE beat Denmark by 119 despite a brave run chase from Frederik Klokker (77), Michael Pedersen (60) and Carsten Pedersen (58) before the Danish tail succumbed. Namibia kept its hopes of getting through to the Super Eight alive with a solid win over Oman at Stan Friedman Oval. All-rounder Gerrie Snyman (76 and 2-19) was the man of the match as the south-west Africans ran out comfortable winners by 119 runs. However, a difficult game against Ireland in the final round of group matches awaits Snyman and friends. Neil McCullum scored his third century in four games as Scotland proved too strong for Uganda at WITS University ground in Johannesburg. It wasn’t all plain sailing, however, as McCullum and Gavin Hamilton (56) were the only ones to get past 20 for the Scots as they posted a meagre total of 209. But Scotland’s bowlers worked well as a unit with five of them taking two wickets each to strangle the Uganda reply despite some good work from skipper Junior Kwebiha (69). Kenya put up a fine run chase after Bermuda had posted a competitive total of 259-5 with David Hemp passing 100 for the first time in the tournament. The east Africans did not panic, though, and through Kennedy Obuya (63), Steve Tikolo (60 not out), Morris Ouma (57), Collins Obuya (43 not out) Kenya got home safely with seven wickets and five overs to spare. In the other game of the day, the Netherlands overcame Afghanistan by five wickets at Vaal University with Daan van Bunge picking up the man-of-the-match award for his unbeaten half-century. Canada failed to capitalise on a solid start as the entire middle order were all dismissed when well-set. A flurry of run outs saw Canada all out for 220 with 2 overs yet to bat. Canada made a great start, reducing the Irish to 42/4, but an unbeaten partnership of 184 between Morgan and O'Brien gave Ireland a comfortable 6 wicket victory. Canada lost the toss again in this battle between the only two undefeated teams of the tournament. They fielded the same team that had comfortably beaten Namibia. Cheema failed again, making just three, but Davison (41) and Barnett (49) put on 82 for the second wicket before both were dismissed by Johnston. Bagai was run out for 17, but Dhaniram (25) and Billcliff (38) put together a solid partnership and at 174/4 after 37 overs Canada seemed set for a good total. However wickets started to fall, and the experienced Irish squad pressed home the advantage with three run outs. When last man Osinde was stumped there were still two overs to go, and the final total of 220 was too few to defend against an experienced and powerful Irish batting line-up. Osinde's first over was highly eventful, with Porterfield smashing two boundaries, being dropped from a top-edged pull and finally Wilson was caught at third man. Barnett took a good catch at cover two balls later to dismiss the dangerous Porterfield and Ireland were 10/2. Enterprising batting from Niall O'Brien took the score to 42 before Bhatti struck twice in three balls, removing O'Brien (32 from 26 balls) and Cusack. Bhatti bowled his 10 overs for 28 runs and three wickets. Morgan and O'Brien however were still there and built a big partnership. Canada were unable to press home their advantage as both advanced to half-centuries. Rao (3 overs for 31 runs) and Davison (4 overs for 34 runs including the rarity of an all-run 6 - two runs, then overthrows) proved expensive. Morgan (84*) and O'Brien (89*) put on 184, and Ireland won with 9 overs to spare. Elsewhere in Group A, Namibia comfortably beat Oman, and Uganda got to within 35 runs of Scotland. In Group B UAE posted a huge total in their win over Denmark, Amjad Javed hitting 17 fours and 8 sixes in a 117 ball 164. Canada and Ireland meet at Willowmore Park, Benoni, on Monday in a vital match in the ICC World Cup Qualifying competition in the battle for supremany in Group A. Both teams bring records of 3 wins from 3 matches into this game, and both will have a confidence from useful performances in the opening rounds. Ireland, who beat Scotland, in its opening match, arguably the battle of the top two teams on pre-tournament form, are likely regarded as favourites by the bulk of the media who track Associates and Affiliates cricket. But, there is a necessary resiliance in playing and succeeding for Canada at this level. The results from the opening games underline how by a range of fortunes, manufactured by whoever, some of the most experienced of recent international players have made themselves available to battle for the cause of Canadian cricket. Almost certainly, the ICC World Cup warm-up loss in 2007 by Canada to Ireland at the St Augustine ground in Trinidad and Tobago is more know by the cricketing masses than Canada's 6 wicket win over Ireland in Kenya a few weeks earlier. But the match at the Jaffrey Sports Ground, Nairobi, was an ODI; part of the inaugural ICC World Cricket League (WCL) - Global Division 1. This World Cup qualifier essentially includes the teams that would be in WCL Divisions 1 and 2. The elite of ICC Associates and Affiliates cricket. Both teams include some of the key figures from the February 4, 2007 game. Eion Morgan lead the batting charge for Ireland on a wicket and slick outfield geared for run scoring. Morgan's 115 runs from 106 balls spearheaded Ireland to an imposing 308 for 7 off 50 overs. It was Morgan's first ODI century. Canada's Umar Bhatti bowled a creditable 10 overs, taking 2 wickets for 35 on a ground where 5 or 6 runs an over was up for grabs. Few experts, to the extent they exist at this level of cricket, would have given Canada much of a chance. Abdool Samad made useful 42, adding 84 runs for the second wicket with Ashish Bagai. John Davision joined Bagai and Canada continued to make good progress in persuit of a formidable total. Some followers of the Irish camp began to worry about another loss after making a solid score. Ireland stumbled in earlier games, particularly against a late flourish by Scotland. Someone even pondered aloud "not only do we look like we might lose, it will be by eight wickets, the way these two are batting. But, with the total on 203 in the 36th over, Davison swung a bit across the line of the ball and was bowled for 57. A certain amount of faith is needed when following Canada, or indeed some of the other sides whose batting can be a variable feast in these encounters. Cometh the hour, cometh the Qaiser Ali to provide a pivotal innings. Ali was one of two named in the Canadian line-up who was ill just before play began, leaving match officials to question if substitute fielders should be allowed when Canada took to the field. Ashish Bagai's fine innings reached 122 out of 260 when he was bowled by Andre Botha at the start of the 45th over. Ali took control, Desmond Chumney provided support and a drive to the legside boundary by Ali brought a famous - for those present - Canadian win. Canada 312 for 4 from 49.4 overs. Two balls to spare. Canada conceded a walkover ODI to Kenya in a warm-up match in Mombassa. Some illnesses impacted several players. Indeed some of the Scots were also less than stellar next day in a loss to Kenya. Ireland prepared for this WCL event on the coast in South Africa. There seemed to be a view that moving to Nairobi would be similar to moving up to the Veldt and the likes of Johannesburg, Benoni, Centurion and Pretoria. But one of the factors that impacts various Associates tournament are playing matches overseas, especially out of season, without players having the time to adjust to major climate changes and local food and water. Indeed, I was on the same flight back to Toronto as most of the Canadian squad after the tournament in Nairobi. While waiting for bags at Pearson International, a couple of the guys suddenly realized I seemed to be coughing. Yes, some 3-4 weeks later after starting to cough in the dryness of Mombassa, I was still coughing. And it would not be going away quickly in the minus whatever cold of Toronto. During the first drinks break of the Canadian innings, something like five Irish players took off like greased-lightning for the pavillion. Resiliance, determination and focus are a key ingredient of the needs to be a successful international cricket. Oh yes, you also need the skills as well, and the fitness. With John Davison leading the way, Canada maintained its 100 per cent record in Group A of the ICC Cricket World Cup Qualifier in LC de Villiers Oval, Pretoria, today with a comprehensive victory over Namibia. Batting first on a good track and with the benefit of a quick outfield, Davison smashed his first century of the tournament off just 82 balls as Canada posted a daunting total of 319. The free-scoring opening batsman was eventually out for 131, an innings that lasted 98 balls and included nine fours and six sixes. It was vintage Davison with no corner of ground escaping his extravagant stroke-making. In reply, the Namibians could only manage 178 all out as they stumbled to their third successive defeat and their dream of playing in the World Cup appears to be drifting away. They now sit without a point in Group A after suffering losses to Uganda, Scotland and now Canada. For Davison and his mates, though, it is a much more healthy story with a place in the Super Eight now secure even though tough group matches against Ireland and Scotland await next week. “The goal was to get through to the next round, which we have done now, but it would be great to knock off both Ireland and Scotland. I fully believe we can do that if we play this sort of cricket. I think we can go all the way,” said Davison. “It was a great place to bat out there. The ball was hitting the middle of the bat quite regularly. I played with a bit of restraint early and then it went pretty well after that. “Up to now in the tournament I’ve probably been going a bit hard too early, which is easy to do when you’re batting with (Rizwa) Cheema because he likes to have a go. I just need to play my own game, I think, and not get caught up in what he’s doing,” he said. Elsewhere, the United Arab Emirates upset the form guide by beating the Netherlands in a thrilling finish at Potchefstroom Cricket Ground. The Dutch batted first and made a respectable 265 off 50 overs thanks to half-centuries from Eric Szwarczynski (56) and the ever reliable Bas Zuiderent (50) with Zahid Shah (4-53) making the biggest impression with the ball for the UAE. In reply, Saqib Ali showed his class, compiling 78 off 88 balls before he was caught by Daan van Bunge off the bowling of Ryan ten Doeschate to swing the game in the Netherlands’ favour once again. Nithin Gopal (51) also did his bit but then number-seven Fayyaz Ahmed, with a crucial 25 not out under pressure at the end, saw his side home in the final over to win by two wickets. Meanwhile, Ireland took care of business with a minimum of fuss against Uganda at Stan Friedman Oval in Krugersdorp. Off-spinner Andrew White took 4-22 as Uganda was all out for 155 with Junior Kwebiha (51) and Joel Olweny (40) the only batsmen to put up a fight for the Africans. Ireland captain William Porterfield made sure any hope Uganda had of defending that low total faded early, hitting 44 off 37 balls at the top of the innings. Gary Wilson made 61 and although a couple of wickets fell late on to make the score respectable, the result was never really in doubt as Ireland won through by six wickets. Crowd favourite Afghanistan suffered its first defeat of the tournament, coming up against a determined Kenya unit at Potchefstroom University. A well-compiled century from Kennedy Obuya along with support from Alex Obanda (60) helped Kenya post 282-5 after 50 overs, a total that proved too much for the Afghans as they fought hard but were eventually dismissed for 175 with Mohammad Nabi scoring a half-century. Oman came agonisingly close to pulling off a major upset against Scotland before falling just short at WITS University. In reply to Scotland’s 274-9 off 50 overs, Syed Maqsood Hussain got his side off to a flyer, hitting an astonishing 70 off just 30 balls, including nine fours and three sixes. But gradually Scotland got back into the game and despite some solid batting from Zeeshan Siddiqui (50) and Nileshkumar Parmar (37), the Scots eventually ran out winner by just nine runs in a thrilling finish with Jan Stander the pick of the bowlers with 4-41 and Dewald Nel bowling well at the death. Canada made it three wins in three with an easy win over Namibia, and are assured of advancing to the Super 8s stage of the tournament. They were led by a scintillating century from Man of the Match John Davison that allowed them to post a target that was always out of Namibia's reach once they had lost 6 wickets for just 43. Canada made one change to the team who played in the first two matches, bringing in former captain Bhatti at the expense of Baidwan. After being put into bat John Davison hit form and got them off to an excellent start. He reached the third century for Canada in the tournament (each by a different batsman) from 83 balls with 5 sixes and 7 fours. Cheema failed but Barnett (46) and Davison put on 136 for the second wicket. Davison put on another 81 with Billcliff before finally beingh dismissed for 131. The Canadian effort faltered somewhat after Davison's departure, but Billcliff made 61 - Bagai, Dhaniram and Balaji Rao failed to make significant contributions. A useful contribution from Jyoti took the score past 300, and the final total of 319 is an intimidating one. Of note was the fact that Namibia used 10 different bowlers in an attempt to stem the flow of Canadian runs. Canada struck early when Namibia replied, the long-standing opening partnership of Osinde and Bhatti re-united. It was Osinde who took the wicket, dismissing Williams in the 2nd over. Bhatti took the second wicket, and then the third member of Canada's seam brigade, Chauhan got into the act. He took two wickets, and Bhatti another as Namibia slumped to 43/6 after 16 overs. Sarel Burger and Bjorn Kotze provided some resistance although slipping well behind the run-rate before Balaji Rao dismissed both Kotze's. Sarel Burger took his time making 75, putting on 70 with van Zyl, and batting mainly for pride than aiming for the Canadian target. Namibia were all out for 178, and Canada are well set for the suoer 8s. Afghanistan lost their first match of the tournament to Kenya, and when Netherlands lost to UAE by 2 wickets, it left Ireland and Canada as the only unbeaten teams in the tournament. After being put into bat Canada seem set for a big total as John Davison hit form. Cheema failed but Barnett (46) and Davison put on 136 for the second wicket. Davison contributed the bulk of the partnership and with half their overs gone Canada are 157/2, with Davison on 90. The day dawned bright and clear in Johannesburg with the Ugandan contingent still on a high after their dramatic last-ball win over Namibia the previous evening. It ended, unfortunately, with the team rueful of chances not taken after Canada batted through the afternoon to hand Uganda a loss in a game which was there to win. With an unchanged side Uganda won the toss and elected to bat in a decision which was somewhat surprising. "We had a look and thought there would be something in it for the spinner's lately", justified team manager Ligyalingi. However, the pitch was bright and bouncy, still affected by the morning dew, and the Canadian team manager, Mike Henry, expressed surprise when Uganda put themselves in, insisting that had Canada won the toss they would have done the same. Henry Osinde opened the bowling against his former compatriots and caused trouble from the start. It wasn't too long before Kyobe fell, however fellow opener Mukasa again showed what an emerging talent he is with a strong 42 runs. Again the Ugandan middle order wobbled, and Musoke will be wondering if his place is secure, but things stabilised under Kwebiha and Kamyuka, the latter putting on a magnificent 85 showing just what he is worth to the side. Ssemanda's fine batting helped to push the total to a fairly respectable total of 232. The Canadians, knowing they "needed this victory", came out feeling that 232 was "gettable" according to Mike Henry. As, indeed, it proved to be, and though Canada looked vulnerable at one point having lost 3 wickets in 14 overs, their run rate was high enough that the later batsmen worked with comfort, and truthfully, never looked seriously challenged, though Uganda tried their utmost to dislodge them. Barnett, fresh off the Australian season, came in, and batted till the end, putting on a marvellous 102 not out taking the team past the mark, and earning man of the match honours. After the match, a weary Kenneth Kamyuka, having given his all, was seen sitting on the sidelines. "We have missed our opportunity today", was all he said. And that about sums it up. Ugandan simply could not put the pressure on Canada when it was most needed in the middle overs, and having put down a couple of chances, found no answer to Canada's experienced batsmen. Tactics will be discussed, plans made, the positives identified, and in Saturday's match against Ireland, back in Krugersdorp, we shall look to see a rejuvenated Uganda, ready for their greatest challenge of this tournament against a very strong side. The revamped Cricket Canada surfaced last weekend, shunning all differences and bringing in new hope for cricketers. "We're going to bring peace in cricket at all levels and OCA (Ontario Cricket Association) will become the home for all cricket. There will be no more exclusions," pledged Ranjit Saini, while talking to SA Focus after being elected the new First Vice President of Cricket Canada. "I am pleased all issues are now resolved and promise we will work together for promotion of the game," said Saini. In its annual general meeting in Markham last weekend, Cricket Canada filled the key vacant positions of vice president and treasurer. Interestingly, Mike Kendall, former First Vice President, who resigned in February, nominated Saini for the position. "I am very thankful to Kendall for his support and nominating my name," said the new vice president. Saini, president of Maple Leaf Cricket Club, board member of Toronto District Cricket Association and former treasure of OCA, now has a lot of responsibility to shoulder in terms of promoting the game in Canada and bonding all associations and leagues together. He has a depth of experience in organizing national and international cricket events as well as in infrastructure and finance. The meeting also elected Charles Pais of Quebec Cricket Federation as treasurer, Bhan Deo Naraine, chief selector senior team, Ron Dip Chand, chief selector junior team along with their four-member each selection body. Cliff Cox was re-elected Third Vice President. Cricket has had a long and loyal following, born not only out of the village greens of England or the dusty Indian maidans, but the war-torn wastelands of Afghanistan and a spare scrap of land in Canada. It is increasingly described as a global sport, despite the lack of penetration into the American market, and yet Associate cricket nations - or minnows as they are understandably coined - still struggle to take the next step up and compete with the big boys. That isn't to say that cricket's administrators are blind to their plight. Far from it. The ICC are lambasted by confused fans and angry journalists - much of it justified, some of it hysterically bombastic - but the ICC's attitude and commitment to developing nations cannot be so furiously challenged. A key figure in ensuring the likes of Kenya, Ireland and Scotland continue to progress is Richard Done, the ICC's High Performance Manager. His job title might sound implausibly vague but his role is altogether more defined. The more Done speaks, the clearer his vision becomes and the more evident it is that cricket - even Associate cricket - is as much a business as a sport. Done may disagree, but his role is effectively as a management consultant, brought in to inject cash and the basics of forming an effective organisation, before setting them free: hopefully with good results. Yet for all the talk of structure and foundation-laying, there is a far greater challenge facing Done. "We're still stuck in that grey area of amateur and professional where players are paid match by match. To make a big difference in the next World Cup, we really have to professionalise them. "To be a better cricketer, you've got to play high levels of competition. You've got to improve by playing better teams than yourself." Canada joins Afghanistan, Ireland, Scotland and eight other cricket teams Wednesday, battling for a place alongside the big boys at the 2011 World Cup. The ICC Cricket World Cup Qualifier, which runs through April 19 in South Africa, will send four teams to join the sport's elite at the World Cup. And the top-six finishers will be granted one-day international status for the next four years, at well as a berth in the ICC World Twenty20 Qualifier and automatic qualification for the ICC Intercontinental Cup 2009-10, which starts in May. Canada opens Wednesday against Oman in Pretoria at the event formerly known as the ICC Trophy. "We expect to beat them, although they have a few hard-hitting guys," manager Mike Henry said Tuesday from the Canadian team hotel in Sandton City, a suburb of Johannesburg. "But we have guys to counter them." Henry reckons Canada is in the more difficult pool, with Ireland, Namibia, Oman, Scotland and Uganda. But he expects the Canadians to finish in the top four and advance to the Super Eights playoffs. Ireland, Scotland and Namibia are expected to join them in moving on. Group B features Afghanistan, Bermuda, Denmark, Kenya, the Netherlands and the United Arab Emirates. Henry sees Kenya and the Netherlands as the cream of the crop there, with Canada and Namibia hoping to break in among the likes of Kenya, Ireland, Scotland and the Netherlands in the race for the final four. For Canada, making the World Cup is a rare moment in the sport's spotlight, even if its three previous visits to the tournament (1979, 2003 and 2007) all ended in the first round and produced just one win. In addition to rubbing shoulders with the stars of the sport, qualification also means more funding from the International Cricket Council for cash-strapped Cricket Canada. "It is very, very important for is to qualify," said Henry, who calls Richmond Hill, Ont., home. The qualifying tournament is also a chance to escape some squabbling back home with Cricket Canada president Ben Sennik taking much of the heat. Mike Kendall, president of the Ontario Cricket Association, resigned as first vice-president of Cricket Canada in February citing "consistently substantial difference of opinion, on important policy matters and the direction of Cricket Canada under your (Sennik's) leadership." A weekend protest at Canada Cricket's annual general meeting in Toronto cited a shopping list of problems including Karun Jethi being dropped from the national team. But problems in the ranks of Canadian cricket are nothing new. While it has had a low profile domestically, the sport still draws plenty of passion. Translating that into success on the pitch and sponsors has been the challenge. Sennik, however, says interest in the sport is "exploding" across the country these days. "So with that growth, we have some growing pains," he said in Toronto. "There have been rumblings recently. We had our AGM (annual general meeting) just last weekend. Most of the things have been sorted out. The thing for us now is to unite and keep our little rumblings aside and start looking at the (World Cup) qualifier, which is a very, very important event for us. "In the history of Canada and our cricket, I think this is going to be a very critical event for us." Henry is happy with Canada's preparations, noting eight of the players attended a six-week high-performance camp in Colombo under former Sri Lankan skipper Marvan Atapattu and trainer Chandrishan Perera. 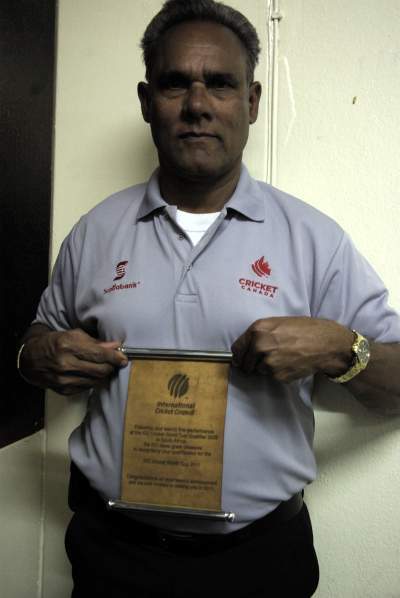 Both are in South Africa to assist Canadian coach Pubudu Dassanayake. There are familiar faces on the Canadian squad. Veteran all-rounder John Davison is back, as is captain-wicketkeeper Ashish Bagai. Davison and Rizwan Cheema are expected to lead the Canadian batting attack. Canada will look to Henry Osinde and vice-captain Umar Bhatti for pace bowling. Other options are medium pacer Harvir Baidwan and spin bowlers Davison, Sunil Dhaniram, and Balaji Rao. Davison (Australia), Geoff Barnett and Ian Billcliff (both New Zealand) are all based outside of Canada. Weather could be an issue at the tournament. "Anything can happen on a rainy day," said Henry. If poor conditions limit play, the team batting second can have the advantage because it can use its 10 wickets to pace itself in reaching the reduced target of the opposing team. Canada went 0-3 at the 1979 World Cup, 1-5 in 2003 and 0-3 in 2007, enjoying highs and lows. in 2003, Davison recorded the fastest century in tournament history (off 67 balls) before being dismissed for 111 in a loss to the West Indies. He also scored 75 against New Zealand. Also in 2003, Canada beat Bangladesh by 60 runs for its first ever one-day international win. And opener Ishwar Maraj became only the eighth player to survive the full quota of overs in a World Cup match, finishing at 53 not out off 155 balls. But Canada entered the record book on a different note when it was dismissed for 36 runs against Sri Lanka, the lowest one-day international total ever. And Maraj's showing against South Africa was also the slowest-scoring innings of more than 50 in a one-day international. Afghanistan advanced to this qualifier by winning the World Cricket League Division 3 tournament in Buenos Aires in January, offering Afghans something to celebrate in a country ravaged by war. Ashish Bagai (capt. ), Umar Bhatti (vice-capt. ), Qaiser Ali, Harvir Baidwan, Geoff Barnett, Ian Billcliff, Rizwan Cheema, Khurram Chohan, John Davison, Sunil Dhaniram, Sandeep Jyoti, Arivindan Kandappah, Eion Katchay, Henry Osinde, Balaji Rao. Canada faced Uganda in the 2nd match of the World Cup qualifiers. Both teams had won yesterday, Uganda with somewhat of an upset over Namibia and Canada crushing Oman. Canada produced a second solid all-round performance, led by an unbeaten century from Geoff Barnett as they won by 5 wickets with three overs to spare. Uganda won the toss and chose to bat. Canada fielded an unchanged team. Khurram Chauhan again made the initial breakthrough, taking three wickets for 20 in his opening spell. Roger Mukasa (42) proved the main resistance but when he was bowled by Balaji Rao, Uganda were 91/5 from 22 overs. The dangerous hitter Kenneth Kamyuka who plays in Toronto advanced to a useful half-century, putting on 66 with skipper Junior Kwebhia. Bagai used seven bowlers in all, holding back Davison and Dhaniram until the later part of the innings. Dhaniram bowled tightly and broke the partnership when he had Kwebhia caught for a steady 17 off 52 balls, then captured a second wicket with the score on 163. Kamyuka had batted with unusual restraint but as the innings wound down he opened up, somewhat spoiling Dhaniram's figures by hitting him for two sixes in his final over. Kamyuka fell in the final over for 85 as Uganda finished on a useful 231/8. In reply Cheema as usual went out with aggressive intent, hitting 2 fours and a six in his 14 runs from 8 balls. When he was caught, Davison upped the tempo but made just 16, leaving Canada at 35/2 in the 5th over. Kamyuka took his second wicket when he dismissed Billcliff (7), and Canada appeared to be in some trouble at 49/3. Barnett and Bagai, however, played sensibly compiling a century partnership. Bagai took the sheet-anchor role, contributing 33 from 70 balls without a boundary. Barnett was joined by Dhaniram, and keeping comfortably up with the required run-rate guided Canada past 200. Dhaniram (39) was out with the score on 225, but Barnett completed his century (102 from 123 balls with 9 fours and a six), and Canada won easily. Elsewhere in the tournament, Scotland beat Namibia easily, and Ireland crushed Oman. Canada face Namibia on Saturday, with a victory assuring them of a place in the super 8s. Afghanistan won their second match, the Netherlands had little trouble chasing down a good Danish total, and Kenya had a 9 wickets win over UAE. Canada lie 2nd in their group on net run rate, just behind Ireland. Oman won the toss and asked Canada to bat. Cheema got Canada off to a fantastic start, confirming his status as one of the most explosive bats in the tournament. He slammed 64 off 44 balls, with 7 fours and clearing the ropes 4 times. There was not much support however from Canada’s experienced batting line up as Davison, Barnett, Billcliff and Bagai all failed. Their main tormentor was fast-medium bowler Awal Khan, who returned the impressive figures of 10-4-19-3. Canada were 125/5 after 28 overs, and in danger of being dismissed well below a competitive total. As he has so many times in the past, Sunil Dhaniram staged a rescue act with the lower order. Jyoti (11) helped him add 38, and after Balaji Rao fell 2nd ball, Havir Baidwan (12). kept his end up and fed Dhaniram the strike, helping add 47 runs. Dhaniram meanwhile was compiling a career-best international limited overs score at better than a run per ball. He reached an unbeaten century off 91 balls with 2 sixes and 10 fours as Canada were all out for 247 in the final over. Former Karachi spinner Tariq Hussain led the Omani bowling with 5/39. The Oman innings got off to a stunning start. Osinde had Desai caught off his second ball, then Khurram Chauhan took wickets with the first two balls of the second over and a third from his 5th - after 11 balls, Oman had lost four wickets for two runs. Chauhan took the fifth wicket, when captain Hemal Mehta was trapped lbw. Oman were 9/5 with extras by far the top scorer on 6. The game was essentially over at that point but Oman staged a recovery, reaching 50 before losing their 6th and 7th wicket to Baidwan. Bagai roted his bowlers and the Oman lower order were able to take the total to respectability before two wickets from Dhaniram finished off the innings. Chauhan's final figures were 4/27. Elsewhere in the group Ireland comfortably beat Scotland thanks to a stunning century from Porterfield, and Uganda beat Namibia in a nail-biting finish. Canada will likely top the group on net run rate and play the Ugandans tomorrow.